The Spring rebound in the stock markets looks likely to continue. For the rest of us, it's sacrifice and grin and bear it. Only if you decide to take it all so meekly and obey the snouts 'above' you. 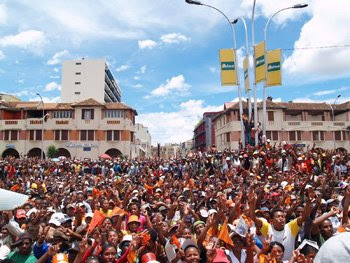 The people in Madagascar aren't taking it anymore, and have felt profoundly aggrieved for quite some time now. The reasons are complex, but ultimately unsurprising - poverty, repression and inequality. So far, so 'normal'. The government can repress a people for a long time before things really start to shift. That shift can take many different forms - in this island of the East coast of Africa, it's taken the form of an army rebellion. As one rebel soldier put it "We are with the people." Once an army defects to the other social power in a society the outcome is clear - either civil war or socialism. These places are not far away lands about which we know nothing. A globalised world means the events in one country spread to others. In a lot of ways, the ruling class use countries like Madagascar, Estonia, Sudan as social laboratories - now their experiements threaten to mutate into full scale rebellion and even revolution. One of the difficult things about living in an era of profound and rapid social change is that the individual pixel can't see the whole picture. Occassionally, though, as in this case, - one sees the cause, the effect and the potential of all the social turmoil, political activism and sheer determination of a repressed people. The Poor List - A vague beginning.